including his epics from StarLord and Tornado, but not his works from Battle or the Eagle. Who could forget Ding Dong Dooley? Dare I say Bloo Baloo? Fun. Epic storylines. Powerful women - in both the literal sense of wielding lots of power, but also the more nebulous/contentious sense of meaning prominent female characters who push forward a storyline and generally don’t take any guff from the other characters. Embracing of Sci-Fi staple ideas and running with them. Deeply unpretentious. Would you trust this woman? Like almost every new writer since, Hebden’s first job was a couple of Future Shocks (some of the first ever, in fact). Unlike almost every new writer since, he then immediately moved into a couple of full series. 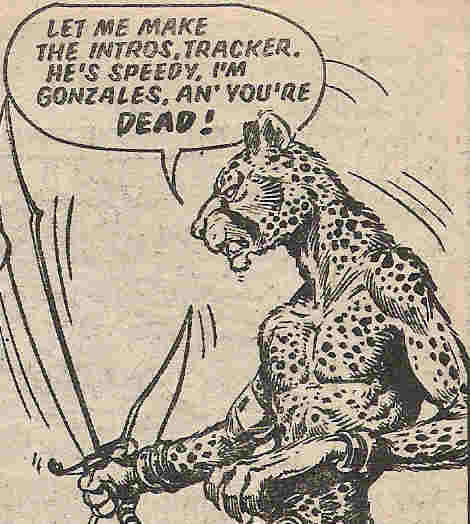 (Of course, it’s not so unusual since he’d established credentials on other comics). Running pretty much concurrently was the much-maligned Death Planet in 2000AD, and the almost-forgotten Mind Wars and Holocaust in Star Lord. Death Planet used to be Tharg’s go-to series for shame, at least until the Space Girls. Miraculously, it has actually been reprinted twice since then, and no longer seems to be quite so hated. It is clunky, to be sure, and possibly suffers from packing too much into a mere 9 parts. I also wonder if it suffers from being in the wrong medium – its set up of a ragtag bunch of naïve heroes up against an evil slaver and her empire is more the makings of a cult TV show than a short comic. Two women, talking to each other, not about a man. Never mind the genre cliches. In fact, this wasn’t even Hebden’s first time pushing women protagonists. Several Progs earlier, he scripted MACH woman, about, you guessed it, a woman with compu-puncture hyper-powers. (Sadly she wasn’t dubbed WACH). 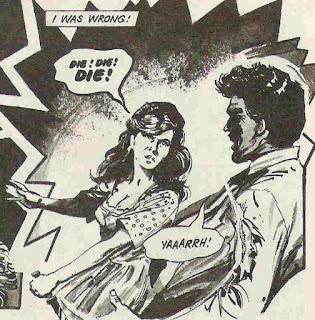 Even more unusual than that, the woman remains a hero throughout, and does not turn out to be a traitor in the final act, as with basically every other female in 2000AD (see Strontium Dog and Rogue Trooper for plentiful examples). Meet Agent Tanya: Russian Spy, or hero in waiting? Again on the powerful women theme, Arlen Lakam from the 22-part mega-epic Mind Wars is a psychic with enough power to destroy the Galaxy. This is a series that is crying out for a reprint (assuming the rights are available). It’s pretty much Star Wars (right down to the title!) 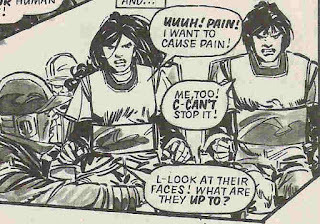 but with both twins using their psychic powers to get in and out of trouble with the evil empire / the heroic rebellion. 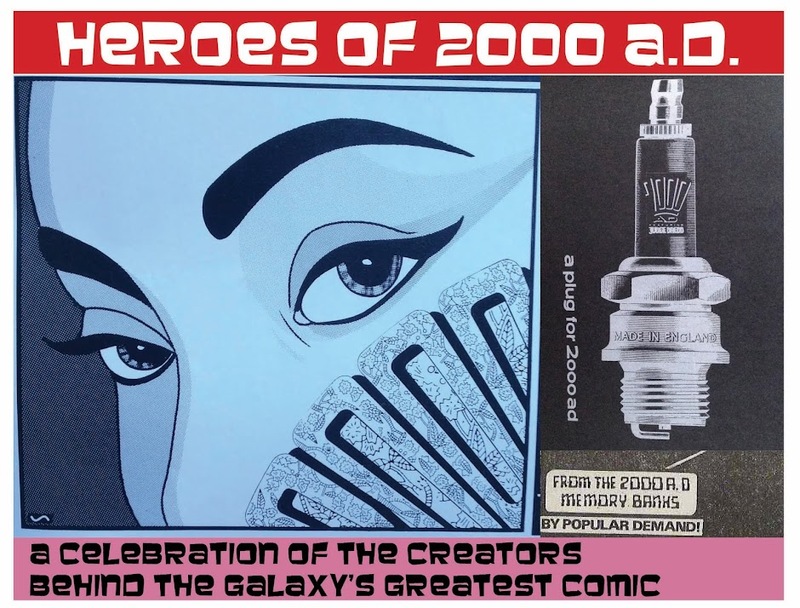 With spaceships, laser battles, and manly men of dubious morals. Holocaust, also in Star Lord, was a more down to Earth tale of alien invasion, very much in the Hebden mode of breakneck plotting, cliffhangers galore, and stakes both so high and so low they end up being fun rather than tense. 'nice woman turns out to be evil', too. I only wish I had the opportunity to read Hebden’s Mars colony epic The Angry Planet, which ran in Tornado soon after Mind Wars wrapped up. The ne plus ultra*** of all this epic sci-fi storytelling is Hebden’s lasting masterpiece, Meltdown Man. I wasn’t old enough to read 2000AD at the time, but I can only imagine what it must have felt like to see a story unfold that literally saw a new episode each week for an entire year. A story, unlike Dredd or Rogue Trooper or even Nemesis the Warlock that was always building up to a climax, rather than telling one-off tales within a certain setting. Other stories have had more episodes, but none has had quite the epic, continuous narrative feel as this. It’s the DVD box set equivalent for 1982. World-building, Hebden style. Meet hero Nick Stone, villain Leeshar, and the Yujees caught in the middle. That's what I call a one-liner. It’s especially impressive when you remember that Hebden was almost certainly making the whole thing up episode by episode as he went along, in the usual style of the time. Presumably he had an end in mind (good guy wins, bad guys loses, with a twist of some kind), but it’s all so deliciously coherent, with an endless stream of fun, Belardinelli-designed characters along the way. Meltdown Man is not complicated, but it’s a fully realised world with well-drawn characters, clear motivations, with plenty of jokes and surprises along the way. Basically, the sort of straight forward good storytelling that just works. The Amazing Maze Dumoir was a fun spy caper that is a little too proud of itself for having the hyper-competent James Bond type be a woman, not a man. 'Holy Nova' wins you a shot if you're playing a Hebden drinking game. The rather excellent Psi-Testers, by contrast, was a dark tale of warring telepaths that may or may not owe a debt to Scanners. Hebden’s final effort for the Prog was book 2 of the Mean Team, in which the death-sports team have a fantasy adventure. Rather like how the Hunger Games is just less fun to read when the characters are not actually participating in a game, the Mean Team just isn’t as good outside of the Death Bowl. There’s no less imagination from Hebden, mind, and as always plenty of incident, cliffhangers and new characters thrown in. And plenty of violence. Let down by a weird double-ending that was both triumphant and nihilistic at the same time, which I suppose is different! "Now it's your turn, evil incarnate!" 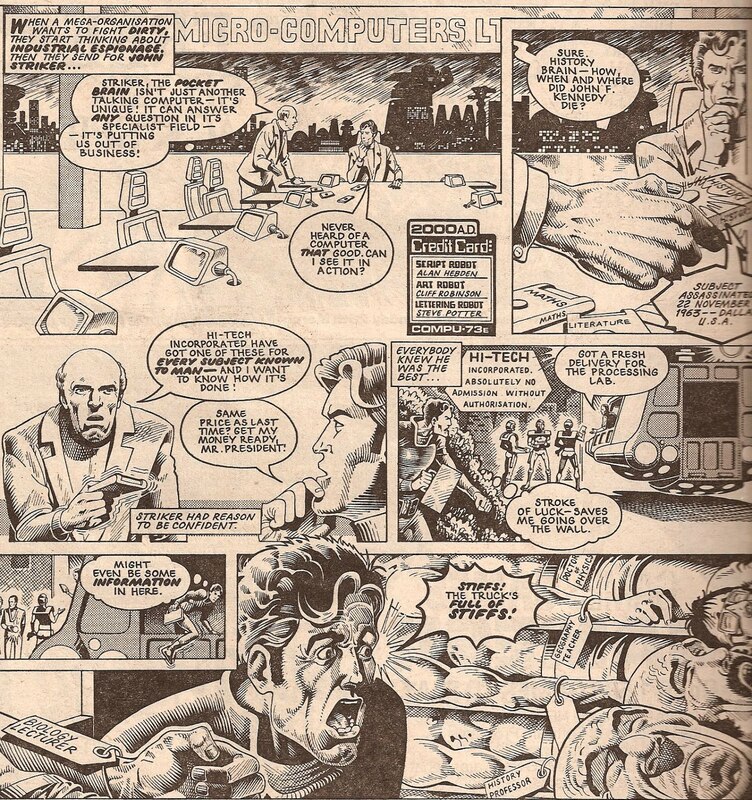 I suspect the real problem was that the story ran at a time when 2000AD was rapidly catering to an audience that had grown up with the comic. 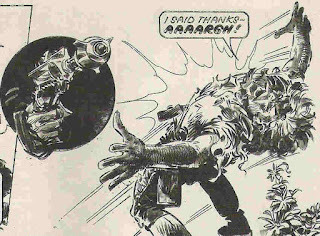 Hebden, like Gerry Finley-Day before him, found himself off Tharg’s rota, but with steady work on 2000 AD’s younger sibling, the Eagle. Perhaps the mass-killing in the last panel was a heartfelt two finger salute to Tharg? A delightful review of Mind Wars. Embarrassingly, this is the first time I've encountered the UK Comics Wikia. I expect it has entries for everyone on this blog! 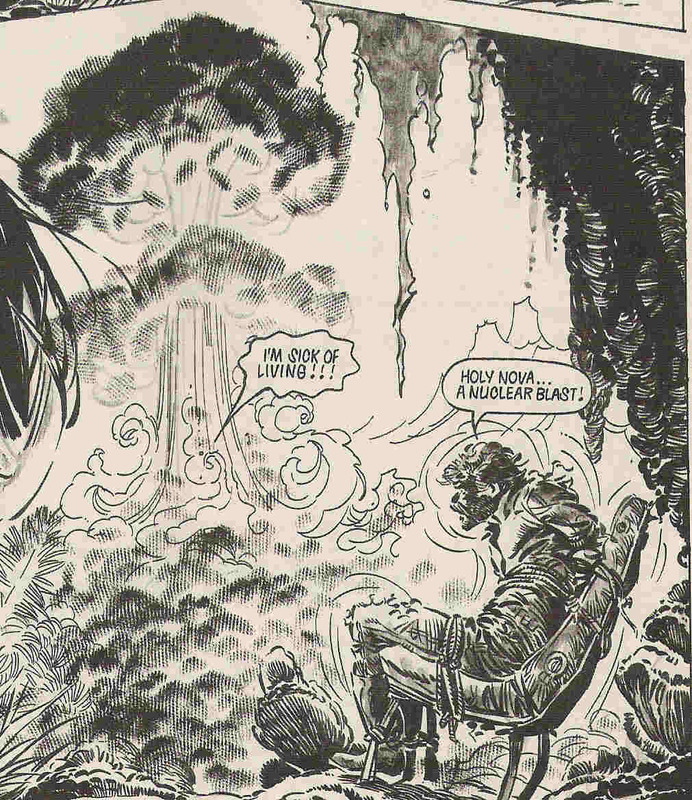 *Lovingly homaged by Gordon Rennie (& Ezquerra again) for the Megazine many years later. ***Hebden may not be pretentious, but that’s not going to stop me from using Latin phrases when I want to. Thanks for the plug. I also loved this article on Alan Hebden. I didn't realise he was behind so many stories I loved growing up. I never did find out how Angry Planet ended - I remember the episode where the heroes were being hunted by robot bloodhounds though.